Maxwell Blake, 11, practiced tying a Windsor knot, one of the skills taught Saturday at the Black Man Can Institute’s mentoring workshop, held at the Shady Hill School in Cambridge. CAMBRIDGE — Brandon Frame undid his striped orange tie and stretched it over his head, so the 40 boys in front of him, kindergartners to ninth-graders, could see it. 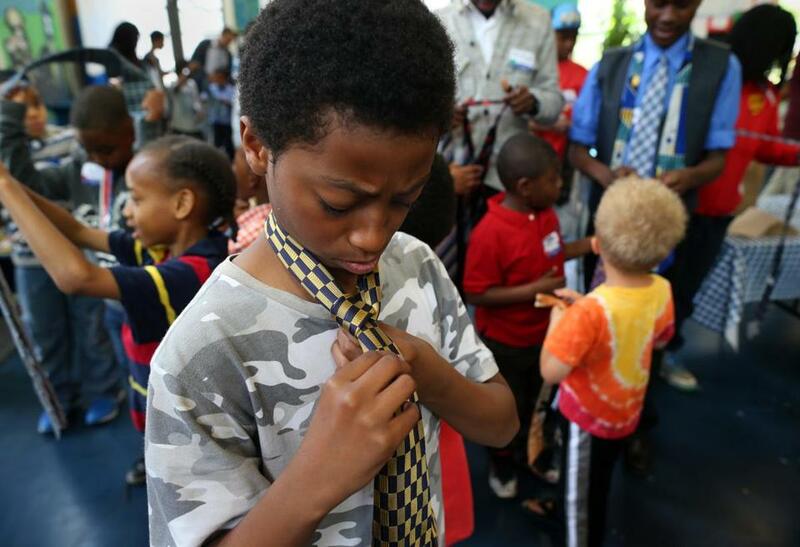 The children, at a workshop for black and Latino boys, were going to learn how to tie a double Windsor knot. “Just so I know everyone is in the same place, you’re gonna wiggle the smaller end — now wiggle the long end,” Frame said. The youngsters, some from public and some from private schools, came to the Shady Hill School Saturday morning for a daylong workshop by Frame and his organization, The Black Man Can Institute. 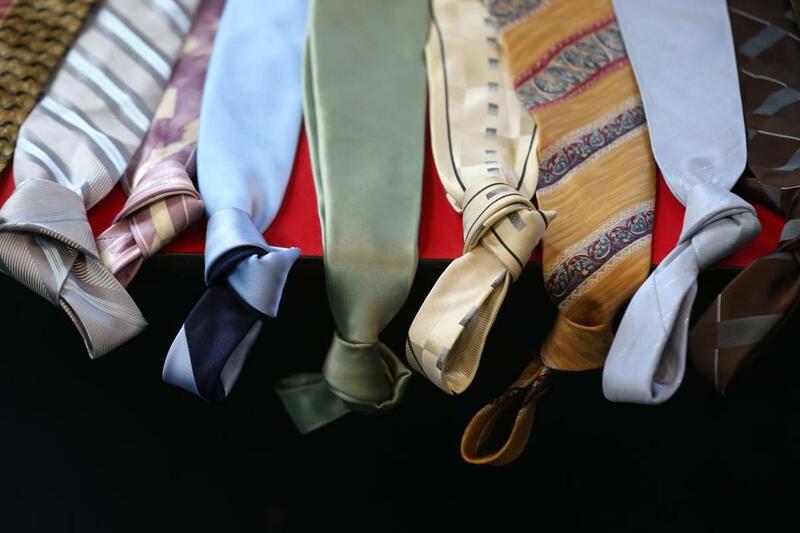 The boys had swarmed a desk covered in ties to pick out their neckwear, which they could take home. Then they looped their long tie ends over short, tying double Windsors on their button-up shirts, polos, T-shirts, and hoodies. Frame and other volunteers instructed older boys to help young ones, whose ties came down far past their waists. While the boys learned about the importance of a positive self-image, education, and financial literacy, their parents gathered to talk more somberly about race, class, and helping their children navigate the world. Frame, also the director of a Hartford high school, started Black Man Can as a blog in 2010 to promote positive self-images for young black men. “It can be a catalyst in a young man’s life, to help that light bulb come on, to see what things they can do and what steps they need to take,” Frame said. He began taking the idea on the road, running workshops for black children and teens, and founded The Black Man Can Institute in 2013. Workshops have had different focuses — in March, volunteers worked with Memphis teens who nearly all had juvenile criminal records. In Cambridge, the day was geared toward children who live or go to school in wealthier, predominantly white environments. The workshop participants were encouraged to keep the neckties they learned how to tie. Damauri Fox-Portis, a seventh-grader at Pierce Middle School in Milton, said his assistant principal suggested the program. “I thought it was a good idea, to help me be more mature and help me with my academics, realistic stuff like that,” Fox-Portis said. Collin Anderson, a seventh-grader at Pope John Paul II Catholic Academy in Dorchester, said he learned about managing finances. After taxes and other necessary expenses, he learned, most people are left with about 2 percent of their paycheck as disposable income. The salary in his example, $60,000 a year, is close to the median household income in Massachusetts: $66,658, according to the US Census Bureau. Anderson, whose mother brought him to the event, said nobody had really talked to him about financial literacy before. “You start to think about this now, instead of later,” Anderson said. Across the Shady Hill School campus, about 30 parents watched a documentary called “American Promise” and talked about the race dynamics that they and their children face in society. Tamyko Morris, a first- and second-grade teacher at Shady Hill who brought her 8-year-old son to the workshops, said she was looking for ways to inspire and motivate her son. Morris came away from the day with a message, she said. Gal Tziperman Lotan can be reached at gal.lotan@globe.com.